Wheeler National Wildlife Refuge "Open House"
As part of the National Wildlife Refuge Week celebration, Wheeler National Wildlife Refuge is hosting an “Open House” at the Refuge Visitor Center located on Hwy. 67 south, Decatur on Saturday October 11th from 9am-5pm. Come out and bring the kids for a day of outdoor activities. You can fish, learn the basics of archery, target shoot with air rifles, explore the corn maze, join in a bird count, take a tethered ride in a hot air balloon, learn about raptors and see them up close, watch a master flint knapper at work, and take in a nature flick in the auditorium. Ranger Kevin will be available at the catfish pond from 9 till 2 helping anyone age 5 to 12 catch the big one. Children must be accompanied by an adult. You can bring your own pole or use one of ours. We even supply the bait. The Alabama Department of Conservation and Wheeler staff will be available throughout the day instructing anyone in the fun and popular activity of archery. The Alabama Chapter of the National Wild Turkey Federation will be available with their popular “Jakes Take Aim” shooting simulator for ages 5 to 17. Children can explore the corn maze and learn the importance of farming for wildlife, then learn to shell the corn the old fashion way. The Decatur Hot Air Balloon will be onsite offering tethered rides and Becky Collier from the Alabama 4H Center will be presenting Raptor Trek! featuring owls, hawks, and a bald eagle at 9am, noon, and 3pm. Tim Baker will be on hand demonstrating the art of flint knapping. Food and drinks will be available for purchase. Visitors can also join Refuge Manager Dwight Cooley at the Observation Building in “The Big Sit!” This annual, international, noncompetitive all day event is a great introduction to birding. Award winning conservation films, including a series of short films, America’s Wildest Places, featuring video tours of National Wildlife Refuges, will also be shown. Please call the Visitor Center at 256-350-6639 for a complete list of films and viewing times. National Wildlife Refuges are dedicated to the conservation of fish and wildlife and their habitats. They also offer a wide range of wildlife-dependent recreation – from fishing, boating, hunting and hiking – to wildlife observation and photography, nature interpretation and environmental education. The Refuge System includes more than 2,500 miles of land and water trails. There is at least one National Wildlife Refuge in every state and one within an hour’s drive of most major cities. 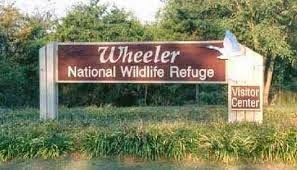 Wheeler National Wildlife Refuge offers wildlife, environmental, and outdoor activities throughout the year. All activities are free and the public is welcome. Please visit the Wheeler NWR website at www.fws.gov/wheeler for more information or call the Visitor Center at 256-350-6639. The Visitor Center is open daily from 9 am to 5 pm.